• Will Balance Be Restored At CWS? : With 38% jump in homers over last season, optimism abounds as flat seam ball is expected to pump more life into offenses at College World Series after only 3 home runs hit during 2013 and 2014 events. 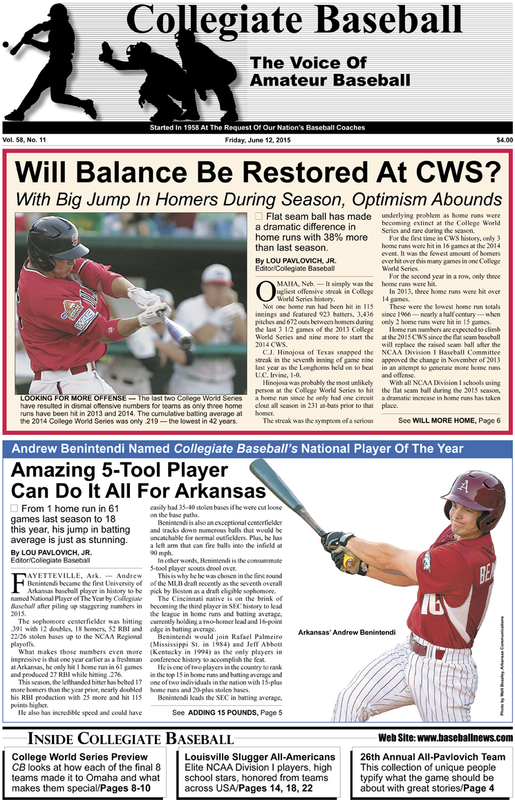 • CB’s National Player of The Year: Arkansas’ Andrew Benintendi puts up monster numbers in 2015 as he improves home run total by 17, nearly doubles his RBI production with 25 more and hits 115 points higher than one season ago. • Coaching Changes: Number of coaches step down across college baseball headed by retirement of Arizona’s Andy Lopez. • 2015 All-Pavlovich Team: Joe Falcone of Columbia is named National Player of The year while California’s David Esquer is National Coach of The Year. • College World Series Preview: Collegiate Baseball looks at 17 key team stats for each of the 8 final teams and lists key players to watch. • Final Regional, Super Regional Results: Complete look at all the scores, highlights of Regionals, Super Regionals. • Collegiate Baseball NCAA Div. I Poll Presented By Big League Chew: LSU No. 1 with 13 wins in last 15 games as Tigers head to College World Series with potent offensive numbers and top ranking last 8 weeks. • College Notes: Dylan Rosa of Kent St. performs one of the rarest feats in baseball with walk-off, inside-the-park home run during 7-6 win over Bowling Green. • Louisville Slugger NCAA Division I All-Americans: Incredible numbers turned in by All-Americans listed over 3 teams. • Ruleball With Rich Marazzi: All facets of runners getting hit by balls explained. • Louisville Slugger High School All-Americans: LHP Coby Weaver (Hallsville H.S., TX) and OF Ashton Bardzell of Ramsey H.S., NJ lead a remarkable group of athletes which include 22 players who were chosen in the first two rounds of the Major League First-Year Baseball Draft..
• Collegiate Baseball’s National H.S. Poll: Parkview (Lilburn, GA) ranked No. 1 at 34-2 after winning 26 straight games to close the season with Georgia 6A state title. • Louisville Slugger Freshmen All-Americans: Incredible athletic achievements led by RHP Alex Lange of LSU, UT Brendan McKay of Louisville and DH JJ Schwarz of Florida. • NCAA Division 2 Championship: Tampa captures 7th national championship with 3-1 win over Catawba. • NCAA Division 3 World Series: Cortland St. wins first title with 6-2 victory over Wisconsin-La Crosse..
• NAIA Championship: Lewis-Clark St. captures 17th national title and first since 2008 with a 10-7 victory over St. Thomas (FL). • NJCAA Division I: Northwest Florida St. wins first championship with 15-1 win over McLennan (TX). • NJCAA Division II: LSU-Eunice captures 5th title since 2006 with 16-1 victory over Western Oklahoma St.
• NJCAA Division III: Tyler, TX repeats as national champion with 10-9 win over Joliet, IL. • California Community Colleges: Orange Coast captures 6th state title with 9-4 win over San Joaquin Delta. To purchase the June 12, 2015 edition of Collegiate Baseball, CLICK HERE.